I’m not quite sure what to say about this. 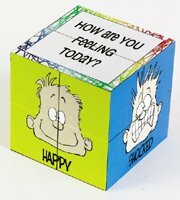 Would you believe that this thing is called a “Mood Dude Cube”? Additionally, would you believe that my boss bought one of these for everyone in our department? It’s kind of funny because a few months ago she took me into her office and told me about how she was collecting stories of all the ridiculous stuff that goes on here. Does she not realize that handing these out to everyone puts her in that category? I’m a little confused. Today my Mood Dude Cube is showing that I’m happy, just like the picture, because I don’t have to come back to this place tomorrow. That looks like something straight out of Office Space.